Over my career I’ve met some brilliant leaders, some holding huge positions of authority inside big organisations and many who do not. However, they all have one thing in common: They really know themselves. In our lives we all want to make the biggest difference we can – to leave a legacy, in an area that matters for us and makes a difference to other people. And therefore it would naturally seem that the place to start would be ‘out there,’ maybe learning how to ‘influence others.’ Well, from my experience this is not the place where great leaders start or indeed draw their energy from. But firstly let me explain what I mean by leadership, and what I believe about leadership, because this word means many things to many people. It’s not a title, role, or level – Some of the best leaders I have known have had little hierarchical status inside their organisation, but nonetheless have made a huge difference to the lives of others. It’s about vision – Leaders create compelling visions of the future, describing what it could look like in the new world they see. Leaders communicate this vision in simple ways that enrol others – it touches, moves, and inspires people to join with them to bring this into reality. It’s a choice – Leadership is available to everyone. It’s a choice to stand for what you believe in and to take action based on that. It often starts with that ‘nagging feeling’ inside you when things just don’t ‘feel right,’ that impels you to say or do something, when everyone around you is following the same, often well-trodden path. And it can often start with seemingly small things; however, often it is the small things that make a big difference. To lead others, first you must learn to lead yourself – Leadership comes from your authentic self, from what matters most to you, which is your Why¹. This is the source of all leadership, and knowing this and being able to articulate it is the starting point for being a leader. Leadership is about serving others – Leadership is never self-serving. Yes, it comes from your own Why, however it’s purpose is to provide something to improve the lives of others. 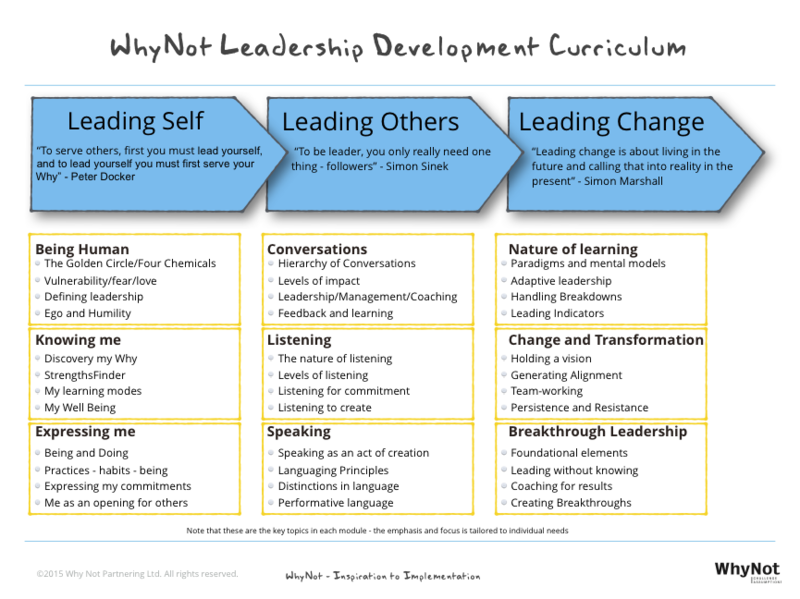 So given these 5 beliefs about leadership, and our experience of working with some great teams and individuals in business, we have developed the WhyNot Leadership Curriculum. Of course, this is just a high level framework to draw from and needs to be tailored to the specific challenges a team or individual is facing. This framework provides a journey of self-discovery and learning, a journey to get to know oneself better and to develop new insights, thinking, and skills that enable us all to be a better representation of ourselves, for others. The best way to start to read this is from the right to the left. To Lead Change, firstly you must be really proficient in Leading Others. To Lead Others, you must be really proficient in Leading Yourself. 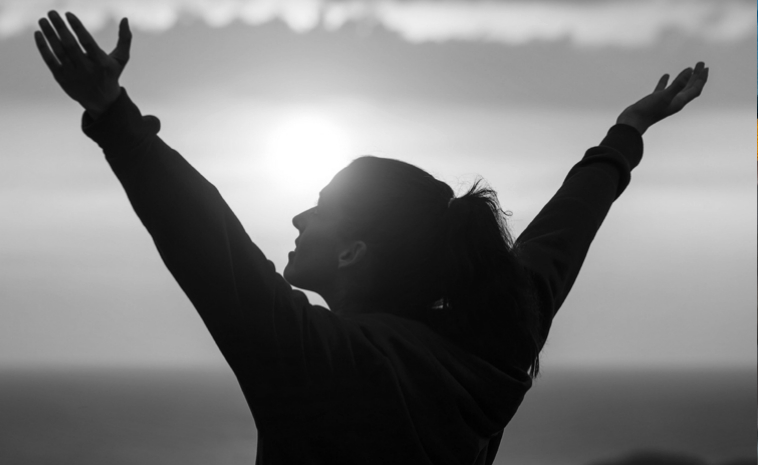 And of course, leading yourself starts with understanding your Why – this is a hugely powerful source to draw from, and as the quote from my colleague Peter Docker reminds us, you are only really being yourself and hence being powerful when you are living a life in service of your Why. The modules in the yellow boxes are simply ways to best engage in this journey. Over the coming months Whirling Chief and WhyNot will be recording a series of videos on these modules. We will explore how anyone can engage with these topics and learn to lead breakthroughs in both the understanding of and application of leadership. Keep tuned, this is going to be fun! Now if this was a bit too heavy, maybe you could be in need of a fun way to look at leadership – a way that illustrates most of the points in this article. This video might do the job… please though bear in mind that, I am sure, alcohol was involved in its production! Watch for related videos from Whirling Chief/WhyNot in 2017! Look forward to seeing what you will be presenting in the videos. And… Hope to play a part in this “game” one day. Fantastic goods from you, man. I have understand your stuff previous to and you’re just extremely great. I really like what you have acquired here, certainly like what you’re stating and the way in which you say it. You make it entertaining and you still take care of to keep it sensible. I can not wait to read far more from you. This is actually a tremendous web site. I’ve also been thinking the very same thing myself recently. Happy to see a person on the same wavelength! Nice article. Very well written information. It will be useful to everyone who usess it, including me. Keep doing what you are doing – can’r wait to read more posts. Pretty section of content. I just stumbled upon your site and in accession capital to assert that I get in fact enjoyed account your blog posts. Any way I’ll be subscribing to your augment and even I achievement you access consistently rapidly.